“It was a sea of calm that came over me and an overwhelming feeling of God’s presence when the Archbishop laid his hands on me,” said Parker Love as he took one step closer to the priesthood. 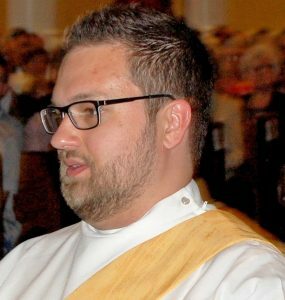 Love is one of four men ordained to the transitional diaconate June 29 at Holy Rosary Cathedral in the Archdiocese of Regina. And although he felt a sea of calm during the ceremony, as a paraplegic who uses a wheelchair, his journey to this point was anything but. Love came to the faith late in life, after growing up with no religious affiliation. However, as an adult he describes how the Holy Spirit called him to baptism – and so much more. “Almost from the beginning, I felt the call to be a priest,” he said. Love enrolled in the Rite of Christian Initiation for Adults program and, at age 23, he was baptized by Father Stephen Bill of Resurrection Parish. After talking with Father Bill and the late Regina Archbishop Daniel Bohan, Love entered St. Joseph Seminary in Edmonton in 2012. A year later, his world was turned upside down. A mountain biking accident sent him in hospital for four months. When he emerged, he was paraplegic – and he remained determined to become a priest. With the assistance of Archbishop Bohan and St. Joseph Seminary, he resumed his studies, finished the formation program and he continues his vocation journey to become a priest. 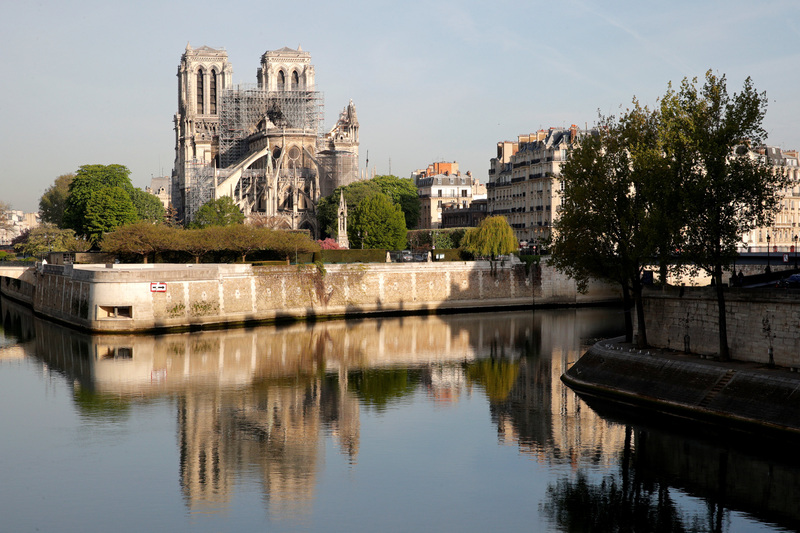 Donald Bolen, the current Archbishop of Regina, said any parish to which Love is assigned will need to make some adjustments and some have done so already. Resurrection Parish, where Love interned, had included an access ramp when the church was completed in 2015. For the ordination ceremony at Holy Rosary Cathedral, a ramp was added to enable Love to move his wheelchair from the nave to the sanctuary to fulfill his calling. “I was feeling super proud, bursting proud, full of the Holy Spirit. It’s a special day,” Love’s mother, Danica, said after the ordination ceremony. Along with Love, Van Chinh (Joseph) Vu, Buu Phung (Anthony) Tran, and Ricardo Escalante were all ordained to the transitional diaconate during the same ceremony. Love, Vu and Tran are expected to be ordained to the priesthood sometime next summer, Escalante by the end of this year. Originally from Trinidad and Tobago, Escalante immigrated to Vancouver to be with family. He spent 10 years practising in law, including time as a legal aide, before answering his call to the priesthood. 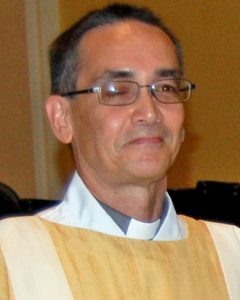 Escalante entered Vancouver’s Christ the King Seminary and later pursued a degree in philosophy in Rome at Angelicum University. It was there that he was introduced to the late Archbishop Bohan, who asked him to come to Regina. 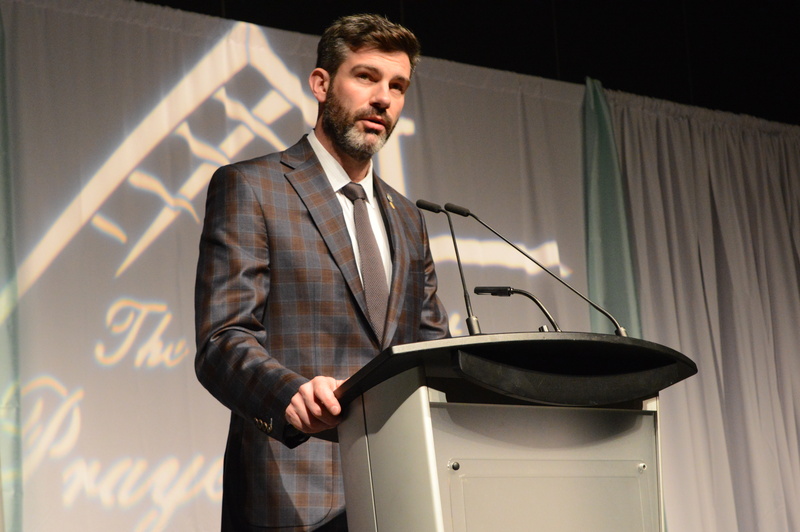 He studied at St. Joseph Seminary and was inducted as an acolyte in 2017 during the centennial celebration of St. Peter’s Colony, about 100 kilometres east of Regina. 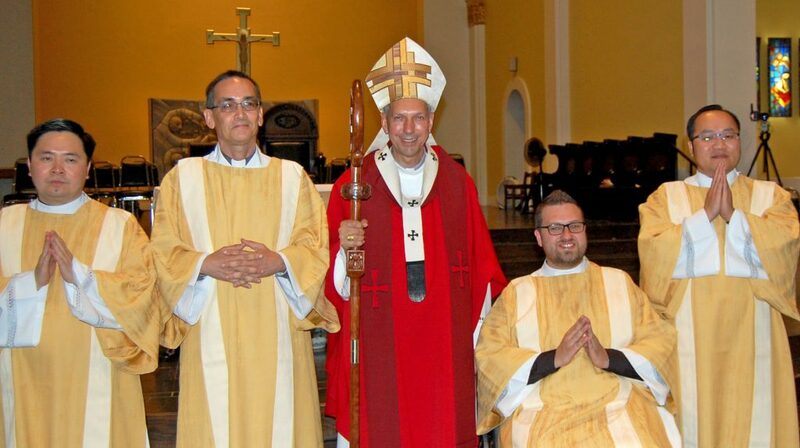 Escalante will return to the Regina Archdiocese when he completes his degree in Rome. For Tran and Vu, their journey to the priesthood began in Vietnam. Vu belonged to a missionary order. He was in the Philippines when he was interviewed by Father Danilo Rafael, the director of personnel and human resources for the Regina Archdiocese, who recommended him to Archbishop Bohan. Vu came to Canada in 2010 and entered St. Joseph’s Seminary. Tran came to Canada three years later through the efforts of Father Thomas Nguyen, the judicial vicar of Regina Regional Marriage Tribunal, and with the support of the Vietnamese community. He, too, entered St. Joseph’s Seminary to continue his formation. –Frank Flegel is a freelance writer based in Regina. He was a reporter for the Prairie Messenger from 1997 until the newspaper’s closure this year.